London, 20th October, 2008: A device that offers consumers an alternative to a smartphone or mini-PC has today been launched by IMOVIO. 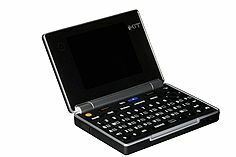 The iKIT is a Pocket Mobile Companion that at 95mm by 65mm and only 15.5mm high is as portable as a mobile phone. Yet the WiFi enabled device comes with a full QWERTY/AZERTY keyboard, an 8GB SD card slot, a 2.8 inch QVGA display and an option to convert the USB for use with an HSDPA dongle, making it a fully functional communicating and browsing device and a viable substitute for a laptop. The stylish iKIT is a dedicated chat, email and internet accessory and unlike smartphones it is fully optimised for that purpose. The clamshell design provides users with a full keyboard and landscape screen that don’t have to be compromised for voice calls. Dedicated hotkeys for all of the applications, including a music and video player and webcam, coupled with the elegant design mean that iKIT is the ultimate, portable multimedia device. The suggested retail price of approximately £99 or €130, combined with the functionality, make the iKIT a very attractive device for a youth audience, as well as appealing to travelers who need a quick and easy-to-use messaging alternative. By buying the iKIT, consumers will be able to save up to £500 on an iPhone* or mini-PC** and with potential operator subsidies the savings may be even greater. For mobile and broadband providers, the iKIT is the perfect device to complement their existing range and can be offered to consumers as an add-on device to go with the existing choice of phones, laptops or HSDPA cards. Alternatively, the iKIT can be used to increase customer retention or reduce churn by offering it as a subsidised device for users signing up or renewing broadband or mobile data packages. On top of the Linux 2.4.19 operating system (OS) the iKIT runs the multi-media and communication tools required by the teen and youth audience. Browsing is optimised for the form factor with Opera Mini 4.1 and the device uses a standard mini-USB port for headphones, charging and synching the device. With storage for over 2,000 contacts and a stand-by battery life of up to 250 hours, the iKIT belies its lightweight, stylish appearance. Price comparisons are based on the following information, current as of 17th October, 2008. - Mini-USB 1.1 used for charging, PC data exchange and wired stereo headset. IMOVIO is dedicated to finding new ways for consumers to take advantage of high-speed broadband Internet and 3G mobile networks. IMOVIO creates simple to use and inexpensive multimedia devices that work with mobile handsets and/or over WiFi home networks. Among its planned product offer, IMOVIO will launch palm-sized IPTV devices and multi-media messenger devices. IMOVIO is a brand of COMsciences, Inc. a Los Angeles, California headquartered company with offices in Paris, London and Shanghai. Since its inception in 1989, COMsciences has offered strategic advice for products and services to the world’s largest consumer electronics brands including Nintendo, Mitsubishi, Sanyo, Sony, Hitachi, Microsoft and a host of others.